Of course, we’re never alone when we’re in trouble. God is always with us, ready to listen to us amd give us a helping hand, and he asks us to trust him more and to celebrate his love for us. The reading from the Prophet Isaiah reminds us that the coming of Jesus didn’t just matter to his mother and father, or his family and their friends and neighbours, it was important even to faraway nations. That’s why the wise men came to visit him. God chose him not just to rescue the people of Israel from trouble but to take his saving power to everyone on earth. Last summer we looked at Hans Memling’s painting of Jerusalem at Eastertime. 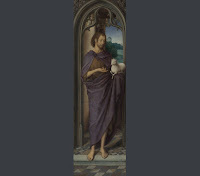 This is another of his pictures, called John the Baptist and the Lamb of God. I think perhaps it’s meant to be a joke. John is shown holding a new born lamb, and very cute it is too. But in the Bible reading John says that Jesus is the lamb of God, and he doesn’t mean that Jesus is all woolly and cute, he means that Jesus is prepared to give up his own life to save other people - even people he doesn’t know - from suffering and disaster. Aaron Ralston had to make a huge sacrifice to get out of trouble, but he did it to save his own life. Jesus made an even bigger sacrifice for the sake of other people. And he still hears our prayers and reaches out to us, to pull us up from the lonely pit of trouble and despair.